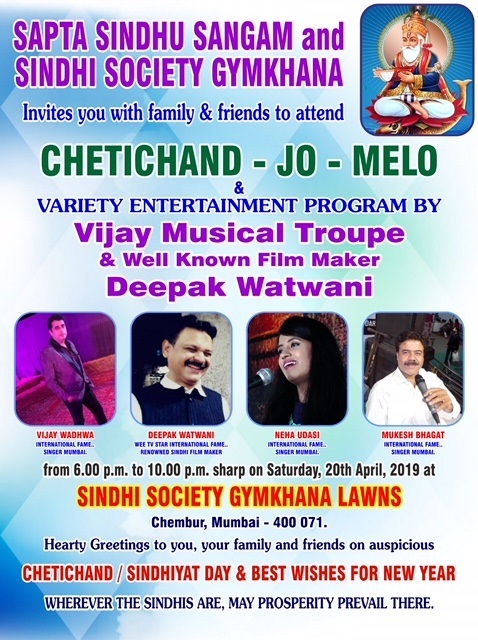 Sapta Sindhu Sangam and Sindhi Society Gymkhana invites you with family & friends to attend Cheti Chand Jo Melo & variety entertainment program by Vijay Musical Troupe & Well known Film Maker Deepak Watwani from 6pm to 10pm on Saturday 20th April, 2019 at Sindhi Society Gymkhana Lawns, Chembur, Mumbai - 400 071. ACTIVITY: Satyanarayan pooja was performed. For this, our Parent and staff Mr. and Mrs. Andre performed the pooja ceremony. Aafter pooja �prasad �and lunch was given to all. 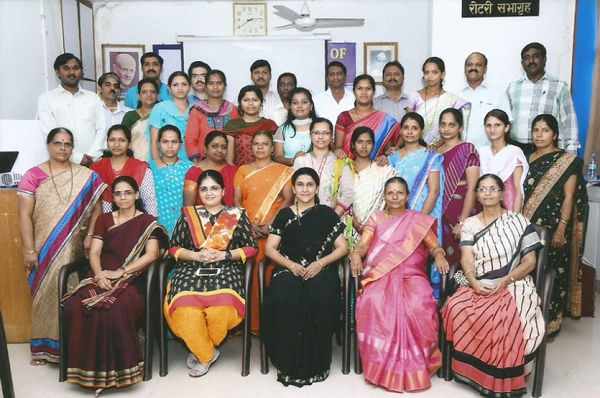 Participants: Special teachers of HI (having RCI registration) in Maharashtra. Areas Covered: Cyber safety, stress management of teachers and students, teacher burn out, new generation diet, Gender and sexuality issues, Use of ICT and open learning resources, work-home balance, self defence. Resource Persons: Renowned high profile experts in the respective areas . Venue: Rotary club Hall, Juhu. Partner in Logistics Support: K.D.N.Shruti school for Hearing Handicapped. Developing a nation is synonymous to developing classroom teachers. With this philosophical base CCYM’s Hashu Advani College of Special Education (www.hacse.org.in) undertakes various activities related to human resource development in the field of special education. The prime focus of the activities of the college is empowering school education for children with disability. Two of the courses that CCYM’s HACSE offers are B.Ed (Special Education - Hearing Impairment) and B Ed (Special Education - Learning Disability) which are affiliated to University of Mumbai and are recognized by Rehabilitation Council of India. CCYM HACSE is the first independent college of special education in India to be accredited by NAAC (Grade ’B’). It is also one of the very few colleges of special education which have been listed under the category of 2 (f) 12 (B) of the University Grant Commission (UGC). Title: Next-Gen students: R U ready? Objectives: To provide avenue to the special teachers to understand the ’non’ academic issues in the lives of the learners which greatly impact their learning in schools. Teaching learning is not possible bypassing these invisible issues which education system to a large extent has kept away from academic discussion so far. Thus the conference intends to provide the insight into the context of the child which have great relevance to his/her learning. RCI credit points to this conference including participants, resource persons and program coordinator is requested for. HACSE remains committed to place photos, registration list (with RCI CRR numbers) and conference report in public domain. -To give an information about dental care. Provide the parents an insight about health and hygiene. Under medical check-up,dental check-up was done of all the students on 21st August by Dr. Maitree Shah and her collegue. 2. Candidate be selected by this committee. No representative of the donor will be involved in the process of the selection. 3. Scholarship is applicable only to ladies. 4. B Ed LD students from first or second year are eligible for the Scholarship. 5. Parameters: Merit and financial background of the candidate. 7. No parameter related to religion, caste, language, community be applicable. 8. Committee will take the undertaking from the student about completing the program successfully. In case of unavoidable situation of quitting the program incomplete by the student, he/she will pay back the amount of the scholarship. TIME TO WIND UP? TIME TO BEGIN? Academic programs in higher education are like roller coaster rounds for both - students and teachers. Work related to entrance test and admissions start before examinations and results are done with. May 2017 has been a very important month since examinations of our first batch of two year B Ed program got over. We are pleased to pump-in yet more special teachers in the field equipped with professional knowledge, skills and attitude. And what follows after final examination is the farewell party. Our first year students had planned it for the second year student on 26th May 2017 and they really made it a special day for everyone. Unlike the usual practice, the faculty gave fishponds to students in the form of certificates. First years presented the second years with saplings - a gift with message! Weldon!! Post Camp was held on 26th and 27th May for the second year students and they were given input on building CVs, appearing for interviews and negotiating salaries. Also feedback was obtained from them on the curriculum, its implementation and the faculty of the college. They were informed about alumni association and encouraged to become members of AAHA. There were games, dances and photos and food. All the best to our students - who will be called alumni in a month! It is a matter of pride and privilege to Chembur Colony Yuvak Mandal to share our biggest moment of fulfillment with friends and well wishers. 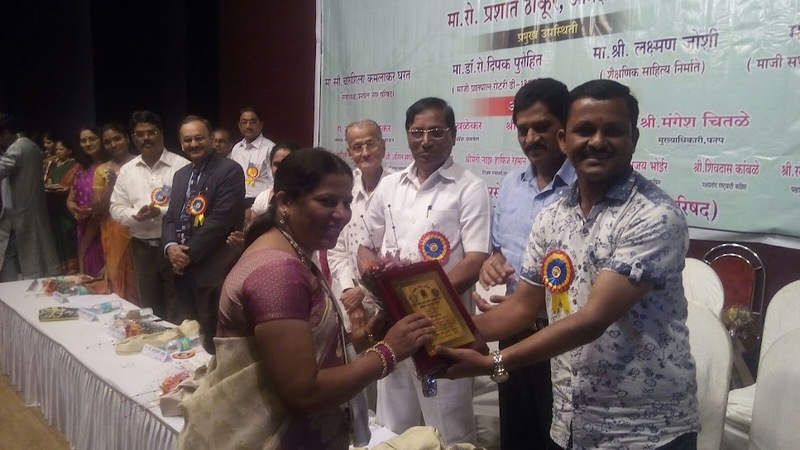 Department of Social Welfare, Govt of Maharashtra felicitated Shri Amar Asrani, Director, CCYM for his unconditional and path making efforts in disability management. 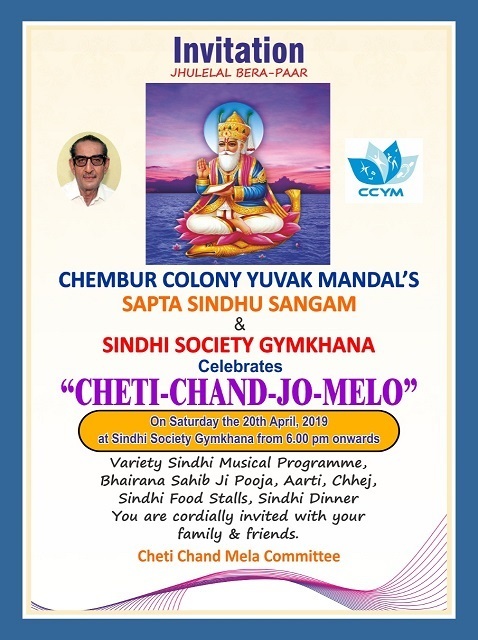 As is known to all and as the ’manpatra’ presented to him on 4th February rightly claims - he is the single most person who is instrumental to establish flagship programs at CCYM which include Rochiram T Thadhani High school for the Hearing Impaired, Hashu Advani College of Special education, and Anil Asrani Vocational College. Thanks to his leadership, all these and many more activities of CCYM are known to be unique and community oriented. On 4th February 2017 he was felicitated by Hon V C of Mumbai University - Dr Sanjay Deshmukh in presence of shri Yshavantrao More and Sri Papan Saheja. The letter of honor presented to him is signed by Secretary (Social Welfare dept, GOM). Staff, beneficiaries and students of CCYM always looked at him as a role model and fondly called him Karmayogi. 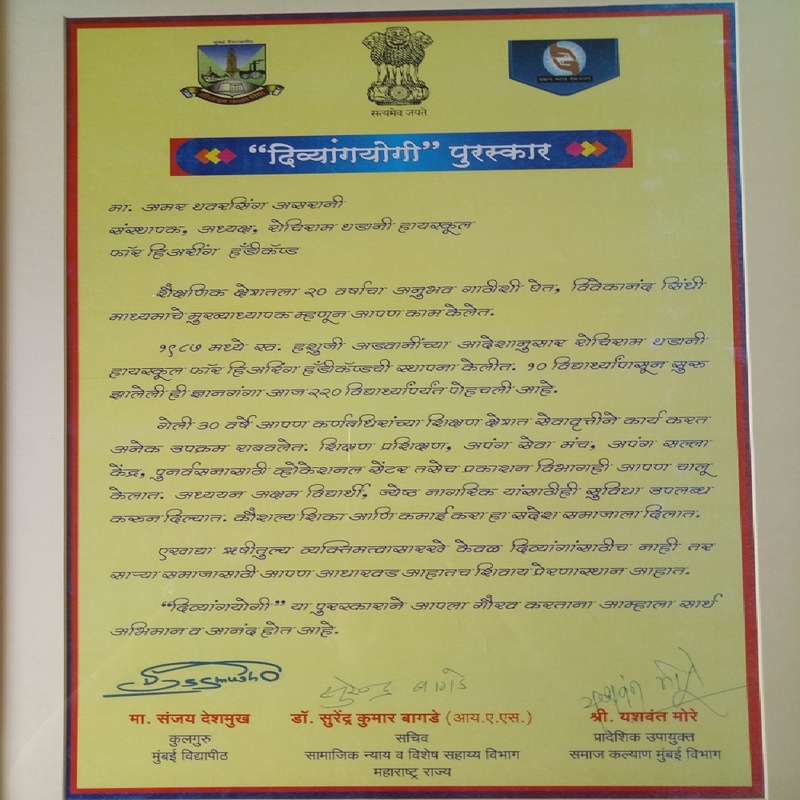 Thanks very much to Govt of Maharashtra to recognize and put on records his service to be ’Divyang yogi’. Our Asrani sir - as expected thanked this gesture but called this to be a bigger responsibility rather than an achievement. That’s what marks an individual to be ’class apart’. CONGRATS to dear sir and to our CCYM family, most importantly the blessings of Shri Hashuji who led us here! University Grant Commission provides non salary grants to colleges as per the norms prescribed in the UGC act. The college has to be in the list of 12 B category to avail this grant. HACSE initiated the process for coming in that category last year. After a stringent and long term process and with consistent follow up, the college has been added in the 12 B list for the XII plan grant. As per the norms a planning board has been established and proposal of availing funds has been submitted to Pune zonal UGC office. India is getting more quality sensitive in the field of education. Higher education is no exception. NAAC is a wing of UGC established for the purpose of quality improvement of colleges / universities / higher education centres through a very demanding and structured process of grading organizations into A, B, C, and D type on the basis of various parameters set for the quality measurement. CCYM’S HACSE is the first independent college entering this process which went on for more than a year. The last phase of the same is the visit of external high level committee visiting the college. Dr Savithri (Director AIISH, Mysore), Dr J Dhillon (Principal Khalsa College of Education, Amritsar) and Dr Ravikumar A (Director, ENT hospital, Chennai) visited CCYM on 14th and 15th March 2016. They very stringently reviewed the working of the college and CCYM in general. They were impressed with a few functioning areas like College - school professional collaborations which are benefitting both mutually, healthy and warm environment and administrative and financial documentations. The college was blessed with the visit of Hon VC of Mumbai University - Dr Sanjay Deshmukh. He appreciated the activities of the CCYM and interacted with the team. The college has score 2.26 with grade B. Dr Gayatri Sirur coordinated this huge activity excellently supported by all members of HACSE and their families. College puts on record the appreciation for Dr Gayatri Sirur for taking the college through this process. CCYM management supported the activity wholeheartedly and spared a lot of time for preparation. The report can not be complete without the acknowledgement of Poonamtai and RTT family for the unconditional support. Last but not the least, current students and alumni worked day in and out for this process and things would have been totally different without their support. Overall, NAAC was a very fulfilling experience and we all learnt a lot out of this. We also renewed our bond with CCYM as a family. The outcome in terms of B grade can be considered a huge milestone achievement. Among the various disabilities, learning disability has the highest incidence. It is estimated to be as high as 7 to 10 children out of every 100 school going children. This is an estimate of developing countries - nobody is sure of Indian numbers. Where do we stand in terms of EDUCATION FOR ALL when almost 10% of the population do not adequately reflect school education policies and their effective implementation? CCYM’S HACSE attempts at being the change that it wishes to bring about. After the tireless efforts to start B Ed (special Education - Learning Disability) for the last 3 years, the pieces fell into place this academic year. YES, long awaited B Ed (special Education - Learning Disability) is starting this year at HACSE affiliated to Mumbai university and recognized by the Rehabilitation Council of India. It has 25 seats and these will be filled by Maharshtra CET. Fees for this un aided program is 50,000 per year or as per the approval of the shikshan shulka Samitee. NAAC Peer Team visit to CCYM’s HACSE for Accreditation of 1st Cycle has been scheduled from 14th - 15th March 2016. The peer team members will be visiting all the facilities of CCYM. A free workshop is organized at CCYM’s HACSE on 9th March 2016 (Wednesday, from 11.00 am to 1.00 pm) to create awareness and reduce the participants’ risk of cancer through early detection and intervention. All alumni are welcome to join. CCYM’S HACSE conducts minimum 2 CREs every year. This year’s second CRE was successfully coordinated by Ms. Kasturi Kulkarni, lecturer, HACSE. This was an RCI credited 3 DAYS programme, held in Kolhapur, in collaboration with Rotary Karnabadhir Shishuvidyalaya. The theme of the programme was ’Facilitating early intervention in natural environment’. As per the feedback received, the participants gained knowledge and skills in early management of children with hearing impairment particularly in pre-schools. 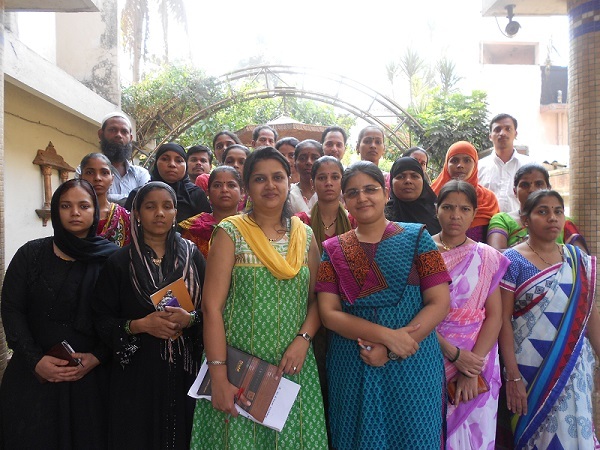 30 participants were from 10 cities of Kolhapur, representing various special schools. Everyone in CCYM looks forward to 22nd Feb since it is our Hshuji’s Jayanti. This is the day of celebration and talent for RTT high school as well as Hashu Advani college of Special Education. Students supported by their teachers showcased a range of co curricular talents. Staff and students were felicitated for their achievements including Dr Gayatri Sirur for her Ph D.. Shruti Sandhan presented a breath taking orchestra which gradually became a participatory dance program. Shri Brijmandal Mahila Samiti Organised their family function where they invited us to perform Pyramid Dance and Silent Anthem. Smt. Poonam Mahajan and Smt. Jayawantiben Mehta attended the programme. They appreciated the performances of our students. This Mandal gave away lots of gifts to students and teachers and donated a Printer to our school. There was a thunderous roar by the audiences. This was the situation when we performed the Silent Anthem at the DCB Bank annual function at NCPA Theatre. As a token of their appreciation they presented to us a cheque of Rs.55,000/- as donation to our school. Mr, J, K, Vishwanath (chief Credit Officer and Mr. R. Venkatesh (Head - Ops IT & HR) handed over this amount to us. My special thanks to Ms. Kamakshi and Aashu. CCYM’S Hashu Advani College of Special Education has organized 3 months training program: ADHIKAR (from 1/12/2015 to 3/3/2016; every Tuesday & Thursday per week) for parents of young children. 28 parents have participated in this program. A total number of 28 sessions will be held for the parents. Parents completing the course will get a certificate at the end. This program is funded by Dr. Rekha Khatri. Please note that the AARAMBHA program scheduled to be held on 5th Dec has been postponed to Feb 2016. Sorry for the inconvenience. please inform the others with whom you must have discussed regarding this program. Thanks very much for the interest you showed in disability and inclusion issues. We really appreciate it and would like to explore more avenues of professional collaboration..
-To motivate students to participate in various competitions. -To appreciate the winners of the speech competition. -Prize distribution of speech competition (40 students)which was held in the month of October It was held in three rounds and for the final round external judges were invited. 7 students from vocational centre are also appreciated for excellent diya decoration. These prizes are sponsored by Lion's club of Chembur. All the students participated in the competition out of which 40 students got the prizes. Some of the prize winners displayed their talent through performances. -For the preparation of diwali celebration, all the classes and corridor was cleaned and decorated by the students by themselves. They also decorated the floor with colourful rangolis. -As a part of diwali celebration 'dandia and garba' was - Organized which was enjoyed by students and staff. -On this occasion' Navneet Publication' sponsored the lunch for all the students and staff. -The chief guest of the programme was Lion H. S. Harjender Singh Pahwa, Lion's club of Sanpada, Governing District Chair-person of Hearing Speech Impaired. -The programme was concluded with Vande Mataram. ACHIEVEMENT: All the children got the proper idea and importance of Diwali. They enjoyed the celebration a lot by participating in it. Learn how to work together through group activities like rangoli making, class decoration, cleaning of the school etc. Students came to know about the importance of our cultural inheritance and importance of the festival. The college is organizing FIVE days CRE (24/11 to 28/11/15) on Indian Sign Language as one of communication options at HACSE, Chembur, Mumbai. Registration fees (DD/cheque Rs. 1700). Registration starts- 19th Oct. HURRY. Breakfast tea will be provided. No accommodation and no lunch. Call on 022-25531041 or 25530451. Prog. Coordinator Dr. Lakshmi Gopalakrishnan. Only 2 participants from each school. Participants are eligible for RCI credit points as per norms. Adding a course on 'inclusive education' is one of the welcoming features of the recently revised curriculum of B Ed. This is expected to go a long way in making schools diversity friendly. To celebrate this 'inclusion of inclusive education' in B Ed syllabus HASHU ADVANI COLLEGE OF SPECIAL EDUCATION along with Rotary Deonar announces an orientation program for the faculty of B Ed colleges - AARAMBHA. Joining hands with the B Ed colleges, team HACSE wishes to contribute its squirrels share in achieving the dream of EDUCATION FOR ALL with SPECIAL attention to the children with diverse needs. Venue: Ground floor Auditorium of VES Management college, Hashu Advani Memorial Complex, (Vivekanand Society's Campus number 2), 495-497, Collector's Colony, Chembur, Mumbai 74. -To present basic concepts and action points related to disability and inclusion. -To strengthen the professional and organizational network towards ensuring justice to addition of the course on inclusive education in the teacher education program. Last date of registration:20th November 2015 (Registration on 'first come first served' basis. Limited seats. Registration form attached. This is to request you to depute at least 2-3 faculty members from your college for this orientation. Knowing about special needs and readying our B Ed student teachers to 'include' them in the classrooms is the need of the hour. HACSE gives you an opportunity to BEGIN this journey through AARAMBHA. Our alumna Ms. Shaila Bansode got best teacher award. CAAI, Hashu Advani College of Special Education, 64/65 Collector Colony, Chembur, 400074. Result of B. Ed. H.I. All candidates successfully completed B. Ed. H.I. with two University Toppers. Special educator full time to teach ICT to deaf students to ready them for BPO jobs. workplace now andheri later shifting to powai. timings 11 to 5. salary 15k to 20 k. English speaking. Aditya Rao, of Fr Agnel School, Vashi, who suffers from autism, scored 91.20%. He gave credit for his success to his special educator, Zeeba Rana. Sabarish Sriram, also of Fr Agnel, who suffers from autism, scored 87.2%. “He finds it hard to converse for long. He is interested in music and writing. Regular studies helped him succeed in academics,“ said his mother, Usha. Hrishikesh Vispute, also of Fr Agnel, who was diagnosed autistic at the age of 2, scored 80% in class X exams. His mother Swati had to quit the job. Duskin Leadership Training in Japan: A Program for persons with Disabilities in Asia and the Pacific. (8) agree to participate in the program at your own risk. Walk in interview for special teachers at ETC New Mumbai on 03/05/2015 at 11.00 am. Candidates come with original documents. A thesis titles “Age Related Trends In Suspicion, Identification & Educational Intervention In Children With Hearing Impairment In Special Schools & Their Relationship With Receptive Language Skills” was submitted by Mrs. Gayatri Subodh Sirur in fulfilment of Ph.D degree in Audiology. She was conferred the Ph. D degree by the Honourable Chief Minister of Maharashtra, Shri Devendra Fadnavis at the convocation of Maharashtra University of Health Sciences held on 22nd May, 2015 at Nashik. She is the first candidate to be conferred a Ph. D degree in Audiology by Maharashtra University of Health Sciences. Dr. Gayatri Sirur went to complete her M.Sc. (Speech Pathology and Audiology) from All India Institute of Speech and Hearing, Mysore after doing her B.Sc. (Speech Pathology and Audiology) from T. N. Medical College and B.Y.L. Nair Hospital, Mumbai. She is currently an Assistant Professor at Hashu Advani College of Special Education. "Central Sector Scheme of Scholarship for College and University Students"
Our children from RTT school and Anil Asrani Vocational Training Institute are participating in a workshop’Paper flower making and quilling’ and also performing ‘Silent National Anthem’on 22nd and 23rdNov,at Priyadarshini Park, Napeansearoad, Mumbai. 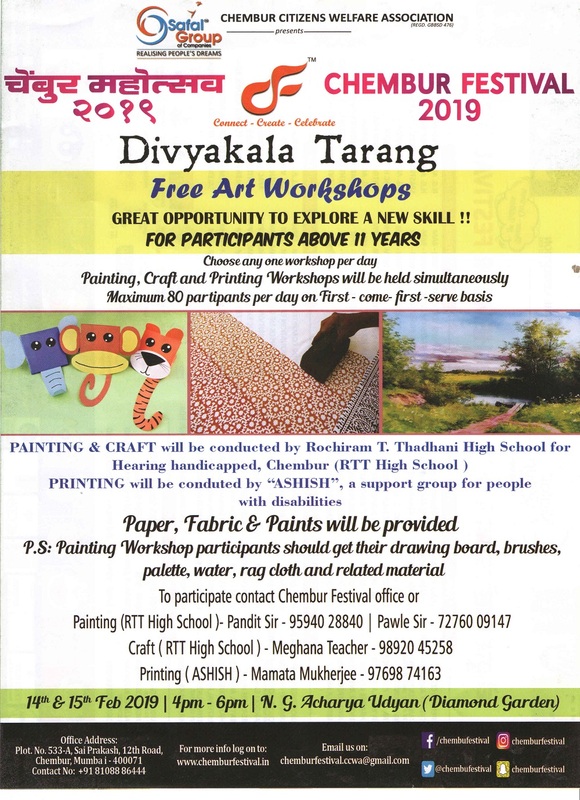 The programme is organized by Indian Heritage Society.In order to revive classical music and folk art and craft in the modern day culture,they are organizing two day workshop. Here our children are performing ‘silent National Anthem’ and some of the students will conduct workshop . They will teach the art to mainstream children. 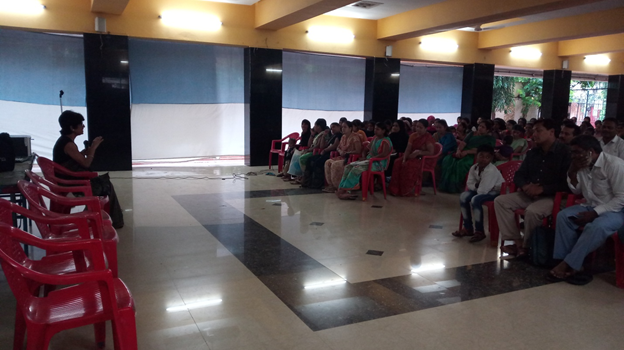 Person interested in the programme can attend and motivate them. National Abilympics was held in Chandigrah on 3rd to 5th Nov 2014. Total 9 students were participated in the same. The events were based on 12 vocational skill. Our students achieved 2 gold, medals and 4 bronze medals in the competition. Our gold medalists will participate and represent India in the competition, which will be held in France in Nov 2015. Rochiram T. Thadhani High School for Hearing Handicapped Hashu Advani College of Special Education B.Ed(H.I.) Anil Asrani Vocational Training Institute. Chembur, Mumbai - 400 074. Date of CET for B. Ed. Degree is announced. ICMH is a 60 years old not-for-profit, ISO 9001:2008 certified Organization specializing in the care and education of mentally challenged and hearing impaired children through its Skills and Ability Schools in Mulund and Nerul (Navi Mumbai). We require the following staff at various locations: NERUL / MULUND: Head / Head Mistress. Persons with experience in teaching and school administration preferred. Qualifications required - M Ed / B Ed. Special Educators: Persons with RCI registration and a degree or diploma for mentally challenged. Qualifications required - M Ed / B Ed / Diploma / Certificate in Early Childhood Care in special need training. Also required Speech Therapists (full/part time) Occupational Therapists. ALL POSITIONS REQUIRE FLUENCY IN SPOKEN AND WRITTEN ENGLISH AND ONE REGIONAL LANGUAGE. Send your detailed CV to icmh11@gmail.com, indicating the position for which you are applying. We are informing you all with a grieved heart as our ex-student Ms. Nasima Khan left us for heavenly abode. For us at HACSE, it is the saddest of the moments. She left behind some pleasant memories of our togetherness. To offer prayer for the soul to rest in peace and to condole with her family and friends, a small 'condolence meeting' has been organized at the Hashu Advani College of Special Education on 22nd Nov. 2014 at 11:00 am. © Copyright 2014, Chembur Colony Yuvak Mandal.